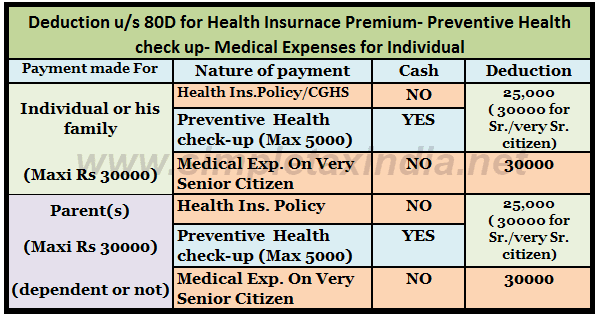 DEDUCTION U/S 80D HEALTH INSURANCE PREVENTIVE HEALTH CHECK UP MEDICAL EXP. 1) Medical insurance premium paid by assessee, being individual/HUF by any mode other than cash. 2) Any contribution made by assessee, being individual to Central Government Health Scheme or such other Scheme as may be notified by the Central Government. Policy to be taken or expenditure to be incurred in whose name? In case of an Individual, deduction is available in respect of medical insurance policy taken in his own name, or in the name his/her spouse, his/her parents and his/her dependent children. In case of HUF, the policy can be taken on the health of any member of such HUF. Deduction on account of medical expenditure shall be allowed only when it is incurred on the health of the aforementioned persons who are very senior citizens. i)“family” means the spouse and dependent children of the employee. ii) Senior citizen” means an individual resident in India who is of the age of sixty years or more at any time during the relevant previous year. Payment should be made by any mode other than cash (however, payment on account of preventive health check-up can be made in cash). (*) total amount of deduction for the expenditure incurred on preventive health check-up of assessee, his family and parents could not exceed Rs. 5,000. In case of a HUF, amount of deduction cannot exceed Rs. 25,000, in aggregate, in respect of premium paid by it on health of any member of such HUF. a) When the premium is paid in respect of any senior citizen (i.e., any resident individual of the age of 60 years or above). 1) Payment of medical insurance premium on his policy of Rs. 15,000. 2) Payment of medical insurance premium on policy of his spouse Rs. 4,000. 3) Payment of medical insurance premium on policy of his younger daughter who is dependent on him Rs. 3,000. 4) Payment of medical insurance premium on policy of his elder daughter who is self employed and not dependent on him Rs. 5,000. 5) Payment of medical insurance premium on policy of his parents (resident and aged 68 years), Rs. 18,000 on policy of his father and Rs. 18,000 on policy of his mother. Both are dependent on brother of Mr. Raja. 6) Payment of Rs. 3,000 towards expenditure on preventive health check-up (for his own check-up and check-up of his wife). Advice Mr. Raja regarding the admissible deduction under section 80D for the year 2016- 17. 1) Medical insurance premium on his policy of Rs. 15,000 will qualify for deduction. 2) Medical insurance premium on policy of his spouse of Rs. 4,000 will qualify for deduction. 3) Medical insurance premium on policy of Rs. 3,000 of his younger daughter who is dependent on him will qualify for deduction. 4) Premium of Rs. 5,000 on policy of elder daughter who is not dependent on him will not qualify for deduction. 5) Medical insurance premium on policy of his parents of Rs. 36,000 will qualify for deduction (being Senior Citizens)-limited to Rs. 30,000. 6) Expenditure on preventive health check-up will also qualify for deduction, but, it will be restricted to Rs. 3,000 only (as the overall limit of deduction under section 80D in respect of assessee and his family cannot exceed Rs. 25,000). Thus, total deduction under section 80D will amount to Rs. 22,000 on account of expenditure on premium paid in respect of his own health, health of his spouse and dependent daughter and Rs. 30,000 in respect of premium paid on policy of his parents. Deduction on account of expenditure on preventive health check-up will be Rs. 3,000 Total deduction under section 80D will amount to Rs. 55,000 (Rs. 22,000 + Rs. 30,000 + Rs. 3,000). 80D. (1) In computing the total income of an assessee, being an individual or a Hindu undivided family, there shall be deducted such sum, as specified in sub-section (2) or sub-section (3), payment of which is made by any mode as specified in sub-section (2B), in the previous year out of his income chargeable to tax. Provided further that the aggregate of the sum specified under clause (a) and clause (c) or the aggregate of the sum specified under clause (b) and clause (d) shall not exceed thirty thousand rupees. Explanation.—For the purposes of clause (a), "family" means the spouse and dependant children of the assessee. (2A) Where the amounts referred to in clauses (a) and (b) of sub-section (2) are paid on account of preventive health check-up, the deduction for such amounts shall be allowed to the extent it does not exceed in the aggregate five thousand rupees. (ii) any mode other than cash in all other cases not falling under clause (i). (4) Where the sum specified in clause (a) or clause (b) of sub-section (2) or clause (a) of sub-section (3)] is paid to effect or keep in force an insurance on the health of any person specified therein, and who is a senior citizen, or a very senior citizen, the provisions of this section shall have effect as if for the words "twenty-five thousand rupees", the words "thirty thousand rupees" had been substituted. (b) any other insurer and approved by the Insurance Regulatory and Development Authority established under sub-section (1) of section 3 of the Insurance Regulatory and Development Authority Act, 1999 (41 of 1999). (ii) "very senior citizen" means an individual resident in India who is of the age of eighty years or more at any time during the relevant previous year. I am a senior citizen assessee and I have paid Rs 5288/- on preventive health check up of my spouse who is also a senior citizen. We have no mediclaim policy. Sall I deduct this amount of Rs 5288/- from my gross pension under section 80D ? The Taxes levied on Medical insurance can also be claimed, i think, as the word is ANY AMOUNTS PAID and not PREMIUM Paid to effect the policy in force....what is your opinion,please. SIMPLE TAX INDIA: DEDUCTION U/S 80D HEALTH INSURANCE PREVENTIVE HEALTH CHECK UP MEDICAL EXP.